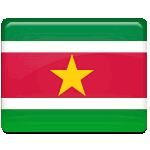 Independence Day is celebrated in Suriname every year on November 25. Back in 1975 Suriname declared full independence from the Netherlands. Suriname became the colony of the Netherlands at the end of the 17th century. The process of decolonization started only during World War II, when the government of the Netherlands went to exile. At that time the United States occupied the territory of Suriname to protect bauxite mines from Nazi Germany. In 1942 the Dutch government-in-exile expressed the desire to review the administration of its colonies after the end of the war. Finally, Suriname gained the status of the constituent country of the Kingdom of the Netherlands in 1954. The Netherlands retained control over foreign affairs and defense of Suriname until November 25, 1975, when the kingdom granted full independence to Suriname. The main events, marking Independence Day, are held at the Presidential Palace in Paramaribo, the capital of Suriname. President of Suriname delivers a speech, which is followed by a military parade in front of the palace and a presidential reception.